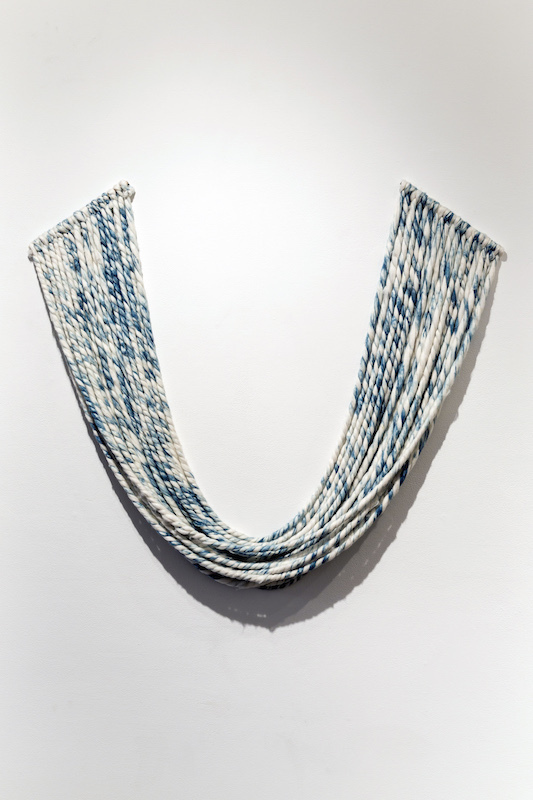 Liz Robb was selected as one of the Knotwe 2015 Student Award recipients by members of the Fiber Textiles Surface Design Resigistry. As part of the award, we asked all the student award winners the same set of questions about the past, present and future within their studio practice and how they see their career ahead. Q: What point in developing process or concept would you describe as a defining moment in your professional development? Robb: My bricolaged fibrous sculptures created while Provence came to life after learning how to dye with woad, the French indigo. 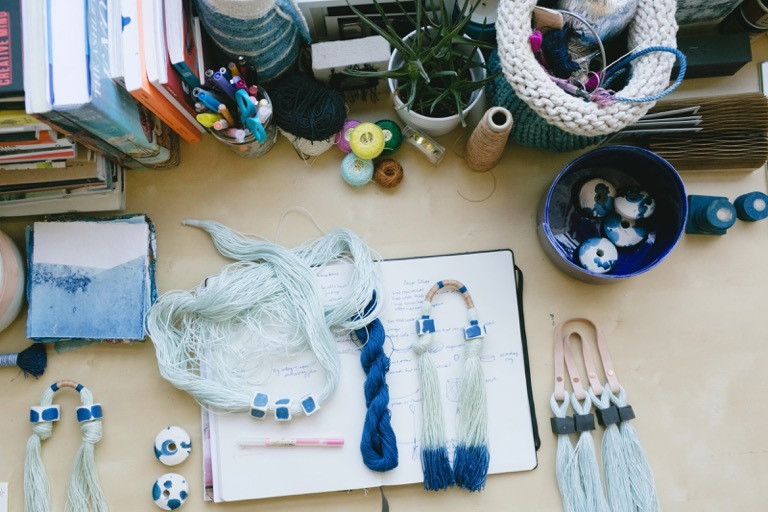 It was a catalyst that led me to explore indigo and other natural dyes, which I continue to utilize in my work. Q: Who or what would you describe as a major motivation in your work? Robb: Establishing my own business and productively managing my day-to-day has been the driving force for me to keep moving forward creatively and fiscally. I perpetually challenge myself to be a better artist and businesswoman. Q: What are the long-term accomplishments that you hope to achieve in the future? Robb: I’ve set up monthly, yearly, and five year goals that have helped shape my daily studio practice. I’d like to find representation with an established gallery and to have shows internationally to showcase my work to a wider audience. I also hope to one day be completely self-sufficient financially with my art practice and with any other creative endeavors I decide to explore. Q: When you consider how to take your next steps professionally, where do you anticipate the future of creative professionals such as yourself heading? How will you and others apply your skillsets and ideas? Robb: Creative people are in every field; I think capitalizing on your strengths as an innovative person and showing others your unique perspective will help build your resume and help you reach your long-term professional goals. Q: How does technology impact your ideas about making? Robb: Technology is intertwined with my daily and creative life, so inevitably it impacts decision-making with my work. Instagram, for example, has become an invaluable tool for promoting and engaging a wider audience with my work, process, and brand. Feedback and encouragement from followers helps me understand how others perceive my work. Q: If there is one place you would like to travel to one day to learn more, become inspired or inform your work in some way, where would that be? To do, learn or see what? Robb: I’d like to travel more intensely throughout Japan to research and experience textiles that are rooted in traditional processes. I’d love to work with a master indigo dyer or learn new techniques with shibori- there is so much to learn! Q: In your experience completing or being about to complete your degree, what about your education was good, bad or you feel needs to be rethought by schools? What was your favorite course or workshop? Robb: My overall education was wonderful; I learned and practiced a lot in a short period of time, and I only wish I had more time to take more specialty elective classes. My favorite course would be Local Cloth, Local Color, taught in Provence by the amazing Pamela Wiley. Being totally immersed in Provencal culture was amazing and inspiring. Q: Do you have any new projects developing? How do you feel this is developing from your past work? Robb: I have a two-month artist residency at the Icelandic Textile Center in Blönduós, Iceland during September and October, so I’m looking forward to creating new work. 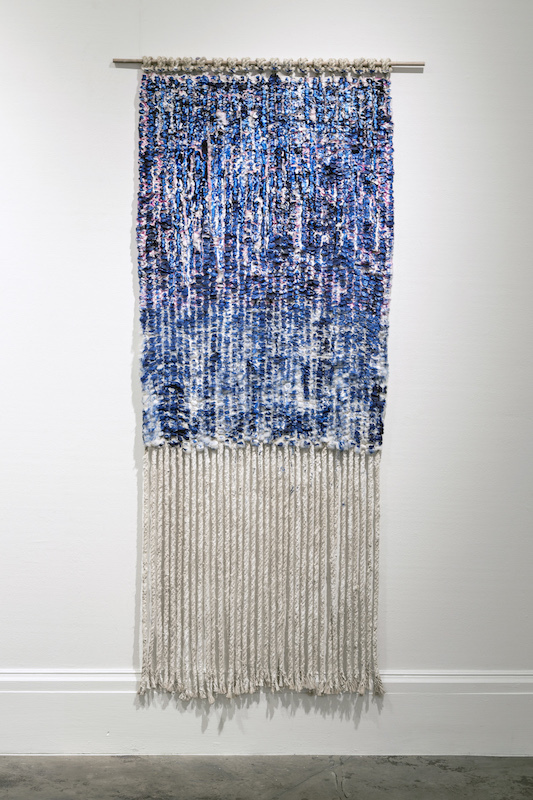 I’ve proposed to create three larger-than-life moveable sculptures, both on and of the loom, using materials I source from the land and surrounding areas, such as wool and plant material.